The new year has brought good cheer to India’s manufacturing sector where growth improved further in December, registering the fastest pace in six months, a new HSBC survey reports. 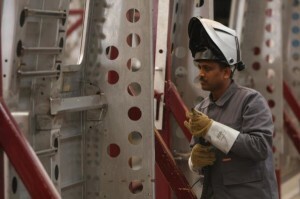 The HSBC India Manufacturing Purchasing Managers’ Index (PMI) – a measure of factory production -stood at 54.7 in December, up from 53.7 in November, indicating a further improvement in the health of the country’s manufacturing sector. HSBC said almost one-third of panelists indicated higher production and 18 per cent noted a decline for the period. “The overall rate of growth was sharp and the fastest in six months in December,” HSBC said. The index has remained above the 50-mark, below which it indicates contraction, for more than three years now. “Activity in the manufacturing sector picked up again led by faster output growth and a further uptick in new orders, which led to a faster increase in backlogs of work as companies struggled to keep up with demand,” HSBC chief economist for India and ASEAN Leif Eskesen said. The December reading of HSBC PMI points to the fact that the sector has gained momentum in the last few months, after it registered the weakest pace of growth rate in nine months in August. The growth in new orders also hit a six-month high. New export orders too expanded, and at a solid pace, it said. Meanwhile, the purchasing activity in the country’s manufacturing sector increased for the forty-fifth consecutive month in December. Going forward, the output is likely to hold up in the coming months as the “final goods inventories’ depletion continued”, HSBC said. On inflation, HSBC said prices eased marginally, but survey respondents noted price pressures from rising raw material costs, firm demand, and the depreciated exchange rate. “With growth pick up led by firmer demand, inflation pressures are likely to remain firm in coming months,” Eskesen said. Inflation as measured by all indices has remained elevated and Wholesale Price Index-based inflation has remained above RBI’s comfort zone of 5 to 5.5 per cent for nearly three years now. In the mid-quarter monetary policy review on December 18, RBI kept key interest rates unchanged. It left the short-term lending (repo) rate and the cash reserve ratio – the amount of deposits banks have to park with RBI – unchanged at 8 per cent and 4.25 per cent, respectively.